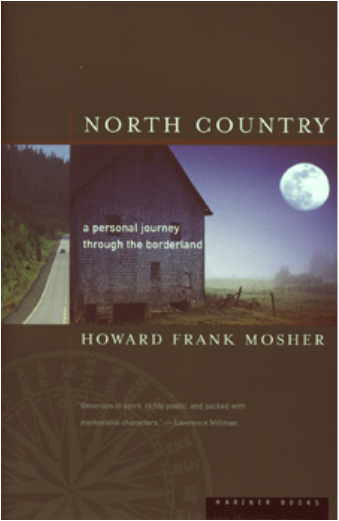 North Country: A Personal Journey Through the Borderlands, Howard Frank Mosher, Houghton Mifflin, 259 pages. $23. Before he’s even out of Vermont, headed east on the first leg of his journey along the U.S-Canadian border, Mosher — for the first time eschewing fiction for peripatetic memoir — drives by abandoned farmhouse "ells" and laments the passing of the self-sufficient family farm from Vermont's Northeast Kingdom. Brook trout populations are down in the cricks and cedar swamps near his home. Just inside New Hampshire, he enters “a region of vast clearcuts: totally denuded hillsides that look like they’ve been subjected to weeks of saturation bombing.” Beside the road a feller-buncher tree-harvesting machine clips “sixty-foot-tall spruces and firs off at the base like giant flowers.” The trees are stuffed in the waiting chipper to be reduced to nuggets and shipped to Maine for the manufacture of toilet paper. The sense of loss these scenes evoke is familiar to anyone who grew up in or moved to northern New England and New York in the watershed years of the ’60s, as Mosher did. Some of North Country's best passages describe the process of attachment he underwent as a boy, when, on fishing trips with his father and uncle to the Adirondacks and Laurentians, his psyche was imprinted with the nuances of northern weather and topography, light and space. Like his literary mentors — Thoreau, Wendell Berry and Ted Hoagland, among others — Mosher knows that to write well about one’s place, to know it in your cells and to evoke it accurately, is not only a good way to live, but a worthy literary calling. He also knows, correctly, that to keep getting his place right over the long term requires him to circulate in the world at large. So, on turning 50, he set out to look at the world along “the longest friendly border in the world,” to gauge its future and that of the qualities that attracted him 35 years earlier. In doing so Mosher has expanded his range and placed himself squarely in the company of Ian Frazier, William Least-Heat Moon and Kathleen Norris, whose documentation of North American geography resists the contemporary homogenization of healthy regional differences. The extremest forms of individualism hug the southern edge of the line, where outcasts are pushed to the margin and Mosher is insulted and threatened by more than one skinhead survivalist. Across the line, on the other hand, he finds no such hostile alienation. The culture there — assisted by subsidized agriculture and logging — seems to emphasize order and the common good. In northern New England, industrial detritus like rusted cars and snowmobiles litter the yards of some working people; in Quebec, where the people and their lives are otherwise the same, painted fences and orderly flower gardens are the rule. The contrast is a subtle one. So is Mosher's strategy throughout the book. Mosher is not out to deliver ringing judgments, and he states as much at the beginning of North Country. He is openly looking for signs of affirmation. North Country concerns itself with where people live and how they live there. In the northeast he talks to old guides and reminisces about old-timers like Jake Blodgett, a horse-logger who once employed him and served as the model for some of his characters. Moving west, he spends time with border guards, bush pilots, large animal veterinarians, cowboys and fellow anglers. He includes in this gallery of hardly northerners himself and his family, and the story of how he fashioned a writing life close to the Canadian border. He plugs his Northeast Kingdom writing buddies and settles scores as well — most amusingly in the case of a rejection letter from Harper's magazine. In these flashbacks Mosher presents his bona fides as the genuine norther article, and a worthy heir to Jake Blodgett. And in documenting scenes of loss and change, he withholds the easy, angry commentary. To bear witness and tell the truth is sufficient. Mosher writes with such clarity and precision that, when our grandchildren start to figure out how they wound up with the land in whatever condition they recieve it, they will know that, while it was changing, somebody was at least paying attention.